In case you need further motivation to keep your hummingbird feeders clean, here is a photo of a male Anna’s Hummingbird with a swollen tongue. The condition is caused by a fungal infection, usually acquired at hummingbird feeders. The condition is often, if not always, fatal. If you feed hummingbirds, please use a mixture of one part WHITE sugar to four parts water, and clean the feeder at least once a week in cool weather, more often when temperatures are warmer. Using any other ingredients, or allowing the nectar to spoil, can be deadly. This post has received a lot of comments over the years, mostly questions about veterinary care of individual birds and other topics that I am not qualified to answer. If you are a veterinarian or wildlife rehabber, and have insight or advice regarding this condition, please leave a comment. If you are seeking advice about this condition, please contact a vet or a wildlife rehabilitation center. This entry was posted in Uncategorized and tagged Anna's Hummingbird, fungal infection. Bookmark the permalink. The tongue is extended all the time, since it swells with the infection and can’t be retracted. The plumage is fluffed up and there is discharge coming from the eye. There is nothing healthy-looking about this bird. Exactly–that is one sick bird. This happens often at UW and it makes me crazy. I have a window feeder I keep scrupulously clean, but get sick hummies at my feeder at least twice a year. Clearly someone nearby is not maintaining a clean feeder and it is heartbreaking to see these little beauties suffer. If you can’t properly maintain a feeder, then please don’t have one at all! Sounds like exactly what happened to one of ours. He would sit still with his beak up in the air and tongue sticking out. Several times for a brief period, he would retract the tongue, but it was mostly out. The day he died, he was sitting on the rail on the feeder, and would shake and appear as if he was going to wobble more and more and almost fall off, then regroup and almost sit still for a bit, then begin to shiver, and finally wobble again, then catch himself again. This went on for about an hour before he left the feeder and we lost track of him, just to find him about 10 feet from the feeder, on the ground dead. What are symptoms of humming birds fed honey water? Honey water ferments very quickly and nurtures bacteria, both of which are deadly to hummers. Hummingbirds do not have access to honey in the wild (and remember that honeybees are not native to the Americas), so there is no reason to think that it would be good for them. White sugar (sucrose) on the other hand, is the main component of flower nectar. I have a hummingbird at my feeder looking just as described. I took down all feeders and cleaned them. This one bird is all that has been here for a week. I don’t want any other bird getting sick. Should I leave the feeders down until the poor baby dies? I use a homemade 1:4 sugar solution. Is commercial solution less likely to have fungal growth? I would leave your feeders up, just clean them often. A homemade solution of white sugar and water is superior to any commercial solution. Will the fungal infection spread if the sick bird returns? Don’t know if any are still following this but the principle culprits are filthy feeders and large reservoir feeders with multi-ports. Lazy if well-meaning humans who have these multi-port feeders are doing the birds no favors if they aren’t cleaned daily. The two main infectious diseases of hummers ( a fungal infection and a pox virus) are both transmissible through dirty feeders and the more ports there are and the larger the reservoir the less frequent the human is inclined to clean them thoroughly. Buy the single-port 4 oz. capacity feeders with the screw-off bottoms and clean and replace them no less often than every couple days, daily if possible. You do the same for your dog or cat. 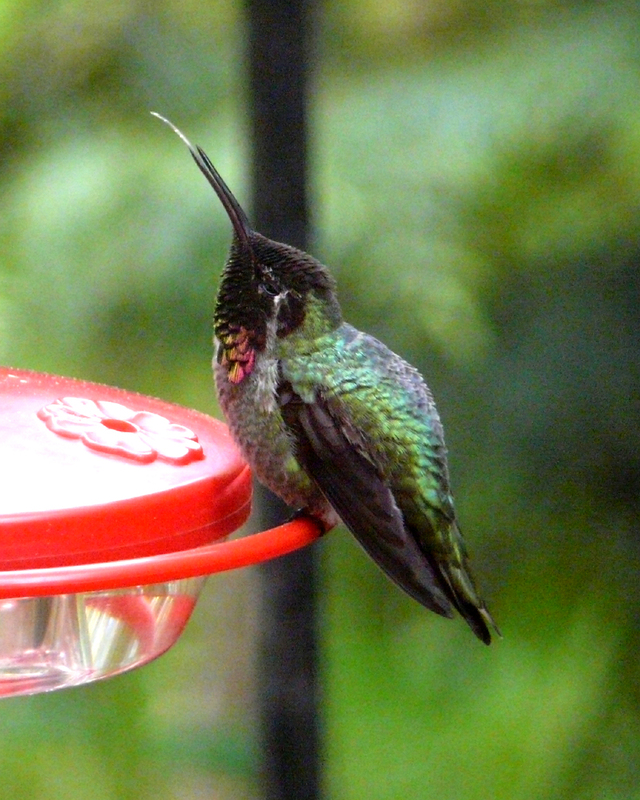 Why treat hummingbirds any differently? Seriously! Do you eat off the same plate and use the same dishes without washing them after every use?